Check that out! That's a stage of next year's Giro. It features the Passo Di Tonale and Aprica as a warm-up for an assault on the preposterously steep Mortirolo, followed by a summit finish and Cima Coppi prize atop the Stelvio. I thought sacki..sorry...re-assigning Angelo Zomegnan was supposed to put an end to these sort of stunt-parcours? Not that I really mind. I think it looks like a cracking stage, and thanks to the densely-packed Dolomites appearing in most years, we already expect the Giro to pile steep climb after steep climb after steep climb onto some stages. 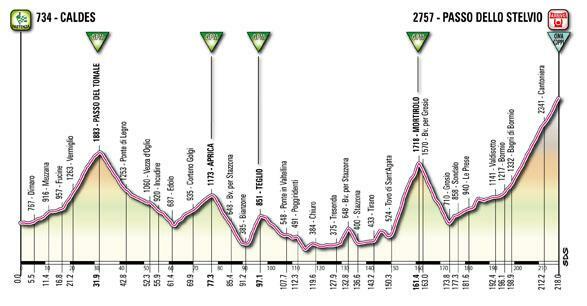 Having said that, this here stage is going to be the penultimate stage of the 2012 Giro d'Italia. So we'll either see three weeks of politely non-aggressive riding as everyone decides to settle a three week race on one day, a la the 2009 Tour De France or, as this is the Giro, everyone will throw common sense out the window and ride hell for leather to settle things beyond reversal before the penultimate stage starts, which reduces the route above to a sort of torture-for-torture's sake. Either way, I'm glad to see that getting rid of Zomegnan hasn't robbed the Giro of its ability to keep us all so beautifully bewildered. This stage should be declared exempt from doping rules. You couldn't put a dog through this without being arrested for cruelty to animals. Light the fuse and watch the fireworks.